Silk Bedding Direct is a UK company with worldwide delivery, that operates at the high end of the luxury silk-filled bedding market. Our mission is to provide the very best mulberry silk-filled duvets, mattress toppers and pillows available today. Dispatched from within the UK on the same or next day of ordering, we deliver worldwide. It is a combination of many small attentions to detail, plus the use of absolutely top quality long-strand mulberry silk for our Luxury Range, and top grade medium-strand mulberry silk for our Premium Range, that have contributed to Silk Bedding Direct being known as providing the very best silk-filled bedding available today. All silk-filled bedding provided by Silk Bedding Direct is OEKO-TEX Standard 100 certified and has the OEKO “Confidence in Textiles” label attached. Our Luxury Range mulberry silk-filled duvet is no ordinary silk-filled duvet. Besides an interior consisting of the very finest top grade long-strand mulberry silk the silk duvets are loop sewn and tied by hand through the casing to prevent movement and to provide additional comfort. Hand sewing is used so that the precious silk inside cannot become damaged, and to avoid expelling insulating layers of air that help create the sensual lightweight feel of the duvet on your body. Our hand-finished method creates a higher quality and more comfortable silk duvet that retains all the great natural qualities of mulberry silk. This is the traditional method of creating silk-filled duvets that was used long before machines were invented. Indeed it is duvets created in this way that were enjoyed by Emperor and Empresses in ancient China and Japan. Besides the Luxury Range the Premium Range mulberry silk-filled duvets were developed in response to customers requesting a high quality, genuine mulberry silk-filled duvet at a lower cost as compared to our rather high-brow, best on the market, hand-finished, Luxury Range. Many of the best features have been maintained from the Luxury Range - 100% mulberry silk interiors, and the same great attention to detail is paid during their production. The two ranges offer a choice of prices, and we firmly believe these to be the very best “Price for Quality” for genuine 100% mulberry silk-filled duvets available anywhere. A special production method is used to create our Luxury Range mulberry silk-filled mattress toppers. To avoid crushing the precious silk inside, attractive flower patterns are loop sewn at regular intervals to keep the silk interior firmly in place. This avoids needing to sew back and forth across the whole of the mattress topper. This superior production method keeps the insulating layers of air between the fine silk threads in place properly without damaging the silk, and results in a more comfortable, luxurious and higher quality silk-filled mattress topper. As with the Luxury Range mulberry silk-filled duvets only the very top grade long-strand mulberry silk is used for the interior of our Luxury Range mattress topper. Again, besides the Luxury Range, a Premium Range has also been created for our mulberry silk-filled mattress toppers, more details below. 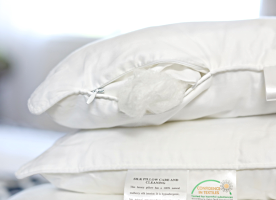 Our mulberry silk-filled pillows are guaranteed filled with 100% pure, natural mulberry silk. Absolutely top grade long-strand mulberry silk is wrapped around a pure medium-strand mulberry silk core to provide the ideal firmness and support. Some producers use off-cuts of mulberry silk left over from the production of other products (these pillows can still be advertised as “100% mulberry silk”). The off-cuts are seamed together using other materials and chemicals and then bleached to give the appearance of natural long-strand mulberry silk. Of course many of the silk's great properties are lost during this process. At Silk Bedding Direct we never resort to such underhand methods, and are proud to produce the very highest standard luxury mulberry silk-filled pillow. This means that the mulberry silk interior remains rich in the amino acids that are so good for health, and our skin and hair, keeping our skin young and our hair naturally nourished. All silk bedding purchased from Silk Bedding Direct is complete with OEKO TEX Standard 100 “Confidence in Textiles” certification label. OEKO-TEX is based in Zurich and is the world's leading quality assurance system for textiles. You can be sure of the best by buying Silk Bedding Direct. Luxury mulberry silk-filled bedding is our specialism. We promise you will not be disappointed. All customers buying now will receive a free high quality carry and store case for each silk-filled bedding item purchased. Orders dispatched from within the UK on same or next day of ordering. Worldwide delivery options at checkout. Click on the bed size below to see Luxury Range Silk-Filled Bedding Sets - wonderfully soft mulberry silk-filled duvets, pillows and mattress pads - in that bed size. » What are the benefits of Silk Bedding Direct's mulberry silk-filled duvets over other types of bedding? The following applies to both our Luxury and our Premium Ranges. No bed bugs, dust mites, mold, fungus and other microscopic life, helps delay skin aging and protects the skin, nourishes and protects the hair, promotes relaxation in the central nervous system and self regulates temperature for snug sleeping. All our silk duvets are made from 100% natural material, no chemicals are used, and are hypoallergenic. They clip together for all year round use, have a longer life with little or no cleaning required and are a very comfortable type of bedding. Click to see of all the wonderful benefits of our Luxury Range Silk Duvets and our Premium Range Silk Duvets. When considering buying a silk-filled duvet the type and quality of the silk used is of the utmost importance. Mulberry silk is universally accepted to be the very best quality in the world. This is because, provided the mulberry silk is high quality, it can be used in its natural state – no chemicals, additives or any kind of treatment is required. Although all mulberry silk is very high quality Silk Bedding Direct select only the very best of the best long-strand mulberry silk for its Luxury Range. Ensuring you enjoy the special luxury of the best of the best. The best mulberry silk has very long threads - some over half a mile / 800 metres long! This means that there are less loose ends and provides much better insulating properties due to being hand-sewn too. They also regulates a person's temperature over a wider range of temperatures than any other type of bedding. Silk Bedding Direct silk duvets are the genuine article, and retain all the natural healing properties of silk to revitalize your body leaving you feeling refreshed, relaxed and invigorated. Beware of cheap imitations that use lower grade mulberry silk or tussah silk that requires chemical treatment and the loss of most of the silk's fantastic qualities. For our Premium Range a good quality medium-strand mulberry silk is used. Although not as luxurious as the top quality long-strand, the medium strand is still a 100% genuine mulberry silk and is hypo-allergenic, completely natural and untreated. Really it is also luxury bedding, we call it Premium only in comparison to our best-of-the-best Luxury Range. At Silk Bedding Direct our whole ethos is to provide genuine high quality mulberry silk bedding - the great reputation we enjoy has been built on this, we promise you won't be disappointed! All Silk Bedding Direct, both Luxury and Premium Range, silk duvets are fitted with a small inspection zip so you can see and feel the wonderfully soft silk inside. Extremely comfortable! Mulberry silk-filled duvets are generally considered to be the most comfortable type of bedding, quickly melting away any stresses of the day. Having slept under a Silk Bedding Direct mulberry silk-filled duvet you'll never want to revert back to any other kind of bedding, nobody does. 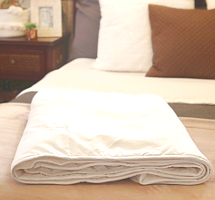 Mulberry silk-filled duvet care is very easy as they will not require cleaning under normal usage conditions. Should your silk duvet become a little flatter after prolonged use airing outside for a few hours, preferably on a sunny day, will enhance the silk's natural properties and make it feel like new again. If necessary use a mild detergent to spot clean or take to a professional dry cleaning service. It is very important to avoid machine washing as this will harm the duvet. Silk duvets that can be machine washed have been chemically treated to make this possible. The chemical treatment destroys many of the great natural properties of the silk too. At Silk Bedding Direct you can be sure of the best quality 100% pure and natural mulberry silk. As is normal practice it is highly recommended use a duvet cover with your silk-filled duvet. Unlike down duvets and other types of bedding mulberry silk-filled duvets are hypoallergenic and have anti-microbial properties and so are naturally free of dust-mites and microscopic life, also they do not retain moisture. » Compared to other types of high quality bedding are mulberry silk-filled duvets as warm? Yes, mulberry silk-filled duvets are very warm having excellent thermal insulating properties. In fact, until you have tried mulberry silk-filled duvets, you never knew bedding could be so wonderfully inviting and comfortable. Due to the nature of mulberry silk and how the duvets are produced they also “breathe” and keep you warm across a wider range of temperatures than other types of bedding. Silk Bedding Direct's Luxury Range mulberry silk-filled duvets are loop sewn and tied by hand through the casing to prevent movement of the silk inside. This is a far superior method to machine pattern sewing as the silk is not crushed and so the thermal properties of your silk duvet are evenly distributed throughout the entire duvet. Seemingly small differences like this add up, that's why Silk Bedding Direct is considered to provide the most luxurious and well-made mulberry silk duvet (silk quilt) on the market today. » What are the health benefits of mulberry silk bedding? The health benefits of mulberry silk-filled bedding are many. It is also especially good for keeping the skin and hair healthy and looking young due to the protein sericin and amino acids that naturally occur in mulberry silk. People with allergies and asthma benefit because silk is hypoallergenic and does not contain bed bugs, mites and other microscopic life that live in almost all other types of bedding (microscopic life cannot live in mulberry silk). The above applies to both our Luxury and Premium Ranges. » Can I purchase a complete mulberry silk-filled bedding set from you? Each of our silk duvet sizes - cot bed duvet, single bed duvet, double bed duvet, king size bed duvet and super king size bed duvet is available in 3 thicknesses; Light Fill (Summer) and Medium Fill (Spring / Autumn) and Combination Deep Fill (Winter) which is a Light and Medium Fill together secured with our easy clip system that comes as standard on all our duvets. Unlike buttons that tend to break off after years in use these small unobtrusive easy to use plastic clips are designed to last for the life of your silk duvet. The above applies to both our Luxury and our Premium Ranges. 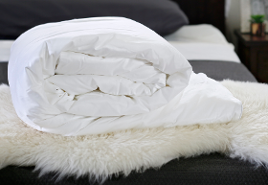 Although we provide 3 thicknesses of silk duvet you can have all 3 by buying just 2 duvets. By selecting “Deep Fill” thickness at checkout you receive both Light Fill (Summer) and Medium Fill (Spring/Autumn) duvets, and these two can be clipped together to make a super snug and warm Winter duvet. In this way you have three duvet thicknessess for the price of two. » How do Summer (light fill) and Spring/Autumn (medium fill) silk duvets fasten together to make a snug and warm Winter (deep fill) duvet? All Silk Bedding Direct duvets, both Luxury and Premium Ranges, have small but strong plastic clips on each corner for this purpose. These fasten your silk duvets together without being intrusive and are much better than buttons which will often fall off after a few years in use. The two silk duvets clipped together are then inserted into your duvet cover just as one would be. Luxuriously snug and warm for those cold nights. » Is mulberry silk-filled bedding inflammable? No. One of the tests to make sure silk is real and not a synthetic copy is to hold a naked flame under it. Silk will only burn whilst the naked flame is held there and will immediately stop burning once it is removed. » Are any chemicals used in making your mulberry silk-filled duvets, mattress toppers and pillows? No, absolutely no chemicals or anything else is used in producing the silk for any of Silk Bedding Direct's silk duvets, they are a 100% natural product. Also, the OEKO TEX Standard 100 “Confidence in Textiles” label that is attached to all our bedding means it has been thoroughly tested for harmful chemicals. The casing for our Luxury Range duvets, pillows and mattress toppers is a high quality 300 thread count cotton sateen, and for our Premium Range duvets and mattress toppers 200 thread count cotton sateen. Casings can be made from silk but are not as strong as cotton sateen (and are substantially more expensive). Cotton sateen casings are therefore the better choice both on price and durability. All the goodness of the mulberry silk interior easily seeps through the cotton sateen casing to soothe and nourish you throughout the night. » I understand your silk duvets are hand-finished, is this correct? Yes, our Luxury Range silk duvets are hand-finished at 2 stages. Firstly, the long-strand mulberry silk interior is hand stretched into the duvet casing, and secondly it is then loop sewn by hand through the casing to keep the silk in place. This produces a superior silk duvet as compared to machine sewing can crush the silk where sewn. 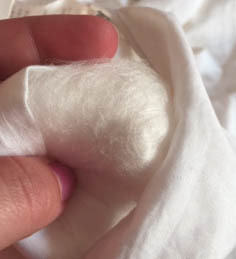 We ask that you be wary of suppliers claiming to provide "handmade silk-filled duvets" because at the very least the material for the duvet casing will be produced by machine. Here we are explaining in an honest and truthful way how we produce our silk duvets. » Which countries do you deliver to? We deliver worldwide. Countries that we regularly deliver to are – UK, Ireland, Germany, France, Netherlands, Italy, Portugal, Austria, Czech Republic, Denmark, Sweden, Finland, Norway, USA, Canada, Russia, New Zealand, Australia and United Arab Emirates. » What are the delivery costs? Delivery is charged at a reduced rate as we pass on to our customers the bulk discount rates we receive from the courier companies. Details at checkout. » How long will my mulberry silk-filled duvet, pillows and/or mattress topper take to arrive? Generally your silk bedding will be dispatched to you on the same day of order, or if ordering late in the day the next day. 95% of orders within the UK are delivered within 2 - 3 working days, and elsewhere within the EU 2 - 5 working days and the remainder of the world 5 – 10 days depending upon the delivery destination. » What is your guarantee when I buy mulberry silk-filled duvets, pillows and/or mattress toppers from Silk Bedding Direct? In addition to your statutory rights we are so confident that you will love our silk-filled bedding that we provide you with a 14 days “no quibble” full money-back guarantee - we will pay for the return shipping costs and refund all monies paid including your original shipping costs, if any. In the highly unusual situation that a customer wishes to use this guarantee they simply inform us by email within 14 days of receiving their silk bedding, we will then arrange for the bedding to be collected. You receive a complete refund of everything paid. Yes, simply use the links in the navigation bar at the top of all pages on the website to select your purchase. An SSL safe and secure online payment system is used. Payment can be made in most currencies. Use the drop-down menu top right of every page to see all prices and the ability to pay in your chosen currency. Use the drop-down menu top right. » What mulberry silk-filled bedding products do you supply? Silk Bedding Direct became renowned as specialists in the production and supply of the very best quality mulberry silk-filled duvets. Adding to that, using the same top quality long-strand mulberry silk and duplicating these same high standards for the production we now also supply silk-filled mattress toppers and silk-filled pillows. Later, in response to customers requesting lower-priced genuine mulberry silk bedding, the Premium Silk Bedding Range was introduced for both silk-filled duvets and silk-filled mattress toppers. In the future we will add silk sheets, silk duvet covers, silk pillow cases and other high quality silk bedding to this fine silk bedding range. All, of course, made to the same high and exacting standards as our silk-filled duvets. » Do people ever regret changing their bedding to Silk Bedding Direct mulberry silk-filled bedding?